The Prince of Wales teased an artist that he always has a “slight worry” before unveiling portraits of himself. The Prince of Wales has sampled a pint of the renowned Tribute Pale Ale as he visited a brewery in Cornwall. The Prince of Wales and the Duchess of Cornwall received a welcome of pomp and ceremony when they arrived in St Kitts and Nevis. 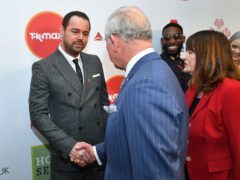 The Prince of Wales and actor Danny Dyer had an unlikely “family reunion” when the pair met at the Prince’s Trust Awards in London. The Archbishop of Canterbury has praised the Prince of Wales’s belief in the “sacred duty of service” as the royal family gathered to mark the 50th anniversary of his investiture. The Prince of Wales compared British seaside towns Margate and Southend to party destination Ayia Napa as he celebrated the UK’s ties to Cyprus.